Craftier Creations: Stampin Up Bonus Days! Bonus Days! 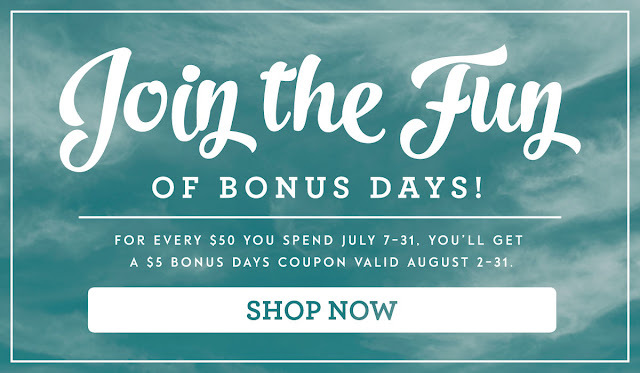 For every $50 USD/$60 CAD you spend* between July 7 and July 31, you’ll get a $5 USD/$6 CAD Bonus Days coupon that you can use between August 2–31, 2016. This is a great opportunity for you and your customers to get items from your wish list, whether you buy them now or with your coupons in August, so spread the word. This is the first time we have offered this type of promotion, and it’s a deal everyone will want in on! Also...we have a new bundle coming. 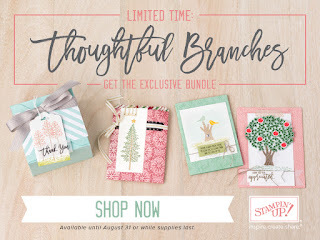 Thoughtful Branches will be available Aug 2nd - 31st. Check out the entire bundle. Let me know if you have any question or would like to place an order.